Shortly after their return, Steve’s great friend, Sergio Garcia, died. Sergio had been a music mentor to children in Pana for many years. He introduced them to the joy of playing music. 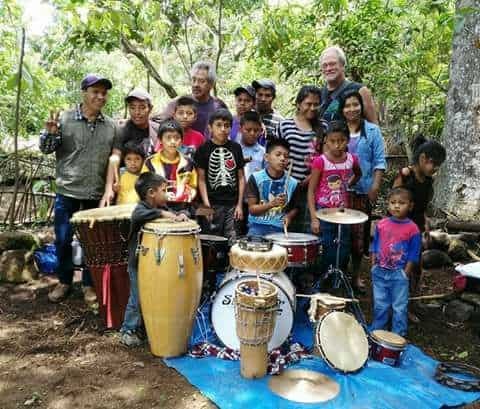 A few months after Sergio's death, Steve and Carlos Cush, a nationally respected percussionist, were talking about Sergio and the idea for a music school for kids surfaced. Of course, there was neither money nor instruments -- and no understanding of how to bring this idea to reality. In the fall of 2011, while visiting Portland, Oregon, Steve talked about the idea with Richard Columbo, founder of the Artichoke Music Foundation. Richard was supportive, and the foundation donated several instruments to Steve. Then, the fund-raising began. Over the next year, with events in Portland and Austin, Texas, Elisabeth and Steve raised the money necessary to purchase Guatemalan handcrafts and jewelry. In 2012, along with sons Quinn and Nick Ulrich, they made a music and merchandising tour from Texas to Minnesota. When they returned to Guatemala, they had just enough money and musical instruments to get the school open. The doors opened in December of 2012.